People often want to simplify their lives. It is a lot of stress to have a complicated life, full of schedules, meetings, possessions, and so forth. Usually, a simpler life translates to less anxiety, stress, frustration, and worry. So, how do we simplify our lives? Follow the step-by-step process below to bare down your lifestyle piece by piece. First, get rid of all the possessions you haven’t used in the last year. If you haven’t put a thing to use in one year, it is most likely to not worth to keep. Get a big garbage bag (even several of them) and walk around your living space. Put anything you haven’t used in one year in that bag and dispose of it. Some items might be more sensitive in nature, like gifts or emergency items. Figure out if you can give them away, or truly need them. Next, manage your social media and electronics usage. We spend more time on our devices than we imagine, usually. These days, people can spend the majority of their days on social media and electronic devices, such as phones, music players, and computers. Though these all-in-one devices are great tools, they should not become the prime focus of our life. In addition, there are so many mobile and computer applications that we are slavishly using. Some people download so many social platform applications that it is almost impossible to keep up with the interactions. For instance, a person might have WhatsApp, Facebook, Viber, Skype, Google+ all together, and he or she struggles to keep up with all the messages. Therefore, it is important to allocate a certain amount of time per day that is necessary to employ these devices. If your work is connected to these devices, make sure you cut down your time on them at home and outside of work in general. Also linked to our social life are our friends and acquaintances. It is sad, but many of us spend time with friends that we do not want to be associated with or do not want to spend time with. Sometimes we get together with people out of sheer habit. Therefore, it is good to write a list of friends you do not want to be with anymore or acquaintances you do not want to meet up with. You can either distance yourself from them, or even tell them as diplomatically as possible that you want to break ties with them. The best option is to show distance, however, as confronting a friend or acquaintance in hopes of dashing the relationship can be stressful and even dangerous. Another important factor in simplifying our lives is getting rid of commitments that are no longer of use or that you do not deem important. A lot of people are too nice, and say yes to appointments, responsibilities, and work that they do not want to do or they deem unimportant. Though it is well and good to be kind to others, give yourself respect and allow yourself to be free of commitments that you do not believe are essential in your life. For instance, maybe you have been volunteering at a local hospital for a few years, but now you only derive stress from this work instead of satisfaction. Or, you may be feeling like you are being used with some commitments rather than compensated enough. You can also write a list of commitments you have and determine which ones are non-essential. On a deeper level, we can simplify our thinking. Most of our thinking is not necessary. The great spiritual teacher Shri Mataji Nirmala Devi said that, “No thought is important.” If you do not want to go that far, try to ignore or witness the thoughts that are not pertinent for the present. Mostly, are thoughts are about the past or future, and involve worry, guilt, shame, nostalgia, and other attached emotions. These feelings can be left out by dealing with our constant thoughts. A continuous stream of thoughts is not necessary, especially since attention to the present is more important than the past or the future. Sure, some planning should be done for the future, but there is no need to overthink. Most of our plans do not come out exactly as we wrote them down or thought about them. Commonly, our plans change so drastically that they hardly resemble what was initially thought of. 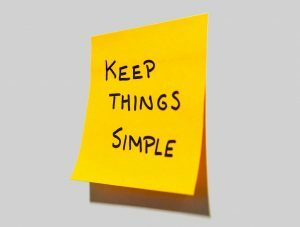 Simplifying our lives is a complex task. We can get rid of possessions that are non-essential, manage our social media and electronics usage, distance ourselves from relationships that are no longer working or are not important, eliminate commitments that are not necessary or are not valuable, and also clean up our thinking so that we are more in the present and do not engage in unnecessary worry, anxiety, or rumination. All these things take energy and time, of which we have only have a limited amount.